The progress never stops. 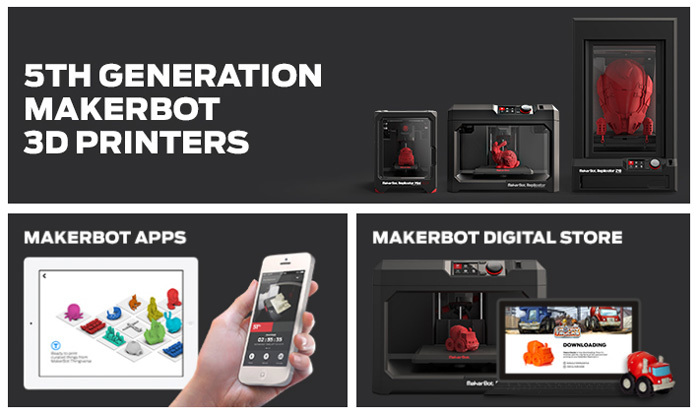 This June MakerBot company, which produces 3D printers since 2009 and makes them affordable for mass users, has launched a new mobile app. The thing is that the company has already several products, including desktop 3D printers, a desktop 3D scanner, the MakerBot Thingiverse app, that’s why they needed a simple and functional app to rule all of this from one place. The app for smartphones is free and works through the cloud. Now the users get the full access to their personal 3D printing library, where they can prepare a file for printing, send it to printing, even monitor the 3D printing process via a local network, stop or pause the job. More than 300,000 downloadable digital designs on Thingiverse.com are now available from a mobile device. It’s easy to share the images of ready-made 3D prints and add new designs. Users now can get notifications, when somebody prints any of their designs and posts a photo if it (“I made one”). The new mobile app is said to be the result of several years of work and really makes 3D printing more available and easy for any user. This entry was posted on Wednesday, June 18th, 2014 at 2:00 am	and is filed under 3D, technology. "Cheapest 3D Printers Ever Now For Everyone"
"Brand New Konica Minolta Bizhub Color Printers"